The 1896 U.S. Supreme Court ruling in Plessy vs. Ferguson made segregationist laws permissible anywhere in the United States as long as railroads, streetcars, and other public conveyances provided equal accommodations for black and white races. The decision, which served as the constitutional underpinning for the nation’s Jim Crow system, was resisted by black civil rights leaders across the United States. One example of resistance emerged in Nashville, Tennessee. Taking advantage of the Supreme Court ruling, Tennessee General Assembly in 1999 attempted to expand the existing scope of segregation mainly in railroads by proposing legislation to make segregation laws apply to streetcars. Although the proposal died the same year in the Tennessee House Judiciary Committee, it was revived two years later in 1901 and was defeated by a 48-30 vote in the House of Representatives. Proponents of the segregation law refused to give up. In the biennial session of 1903, they again pushed for the law’s enactment and won passage of the act. On June 7, 1903, however, the Tennessee Supreme Court ruled that the new streetcar law was unconstitutional. Two years later, when the General Assembly convened in January of 1905, a newer version of the segregation law was introduced which addressed the concerns of the Tennessee Supreme Court. On January 10, Davidson County’s Representative Charles P. Fahey of Nashville introduced Bill Number 87 to separate white and colored passengers on streetcars. After two or three inconsequential amendments were adopted, the bill, as amended, passed the lower house of the legislature by a vote of 81–4. It was than transmitted to the upper chamber, where it passed by a 28–1 vote. The law which passed on March 30, 1905 was to become effective on July 5, 1905 and required operators of streetcars to designate by means of “conspicuous signs” which part of the car was for white or black passengers. Any passenger who refused to occupy the racially designed seating area was liable for a fine not to exceed $25. Rev. J.A. Jones, pastor of St. Paul African Methodist Episcopal (AME) Church, and a prominent black leader in Nashville, predicted that nine out of ten African-Americans would rather avoid streetcars than accept a second-class status. The Nashville Clarion, a black weekly newspaper edited by Rev. Edward W.D. Isaac, urged its readers to buy buggies if they could afford them and, if not, to walk. On July 5, 1905, the day the new law went into effect, black Nashvillians boycotted the Nashville Transit Company. Once initiated, the transit company lost hundreds of customers per day and saw its revenue drop dramatically. The Nashville streetcar boycott soon became the largest example of an urban transportation protest before the Montgomery Bus Boycott, half a century later. In addition to their avoiding the Nashville streetcars, a group of prominent local blacks created the Union Transportation as a black-owned transit alternative to the segregated Nashville Transit Company streetcars. 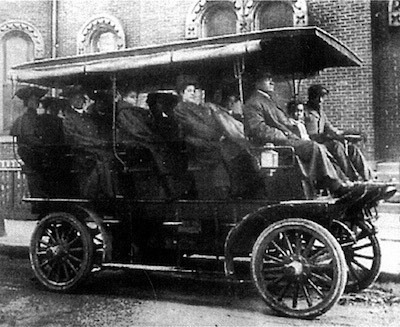 Chartered on August 29, 1905, and operational by October 3, 1905, the new company began to experience difficulty with its steam-driven cars and later its electric-powered buses. Also by October, many blacks slowly began to return to the Nashville Transit Company streetcars. By 1907, the company closed but the boycott itself effectively had ended by 1906. “Nashville Street Boycott,” Tennessee State University Archives, http://ww2.tnstate.edu/library/digital/nashv.html; “Nashville Street Boycott,” Nashville Public Radio, http://nashvillepublicradio.org/post/50-years-rosa-parks-bold-nashville-streetcar-protest-defied-segregation#stream/0; Bobby L. Lovett, Walden University (1868-1925) A Profile of African Americans in Tennessee History (Nashville: Tennessee State University, 1996).